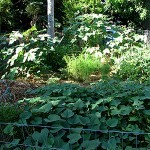 Here’s what’s going on in the garden this summer of 2009. 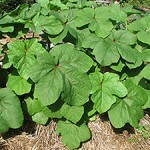 I am growing okra, black eye peas, peanuts, green peppers and sweet potatoes as well as my perennial, asparagus. Long Beans have just quit, and new long beans are in the ground. It is perfect timing for some new seeds, so I put in some more peas, and some biter gourd seeds as well as some early cucumbers. It is really early for cucumbers, but they are shaded from the south side so I am hoping they will make it through these last summer months. They have already broken the ground, and I am feeling optimistic. 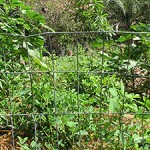 These are a variety of pickle cucumber called Small Leaf. 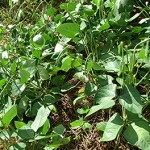 They have small leaves and are a little better suited for this heat and humidity. While it is a little early for starting cucumbers it is not early to be starting long beans, or pole beans, lima beans, basil, eggplant, tomatoes, peppers, summer peas and okra of course. You can also start watermelon and cantaloupe, pumpkins and corn in August. The most active part of hurricane season is upon us now as we watch storms whip up on the west coast of the African continent and spin off towards us. A couple so far have fallen apart and made land fall as some badly needed rain storms. These storms are also bringing some balmy winds that help to make working outdoors more pleasant. It is a crap shoot planting up new beds at this time of the year. One never knows if hurricanes will destroy an early crop, but if the weather permits those first harvests are very valuable. If the storms come and knock down the crops get out the choppers and make mulch! There’s time for more planting. If you don’t have your beds together yet, don’t freak, there is time yet to put those boxes or mounds together, and have your first seeds or transplants in before September ends. Here We Go Again. Happy Planting! 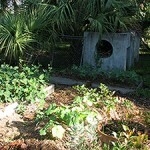 Hope this hurricane season is kind to your wonderful garden!! I really enjoy the food you put on our table every night. Nothing like fresh cut veges and a Goat burger. You a damn good cook too. And good looking…Thanks..
My garden in Illinois is winding down. Just harvested a bunch of tomatoes and made pesto from the basil and parsley. Not sure if the brussel sprouts prefer cooler weather and even in their holey state will produce brussel sprouts later on. Happy planting! Hope the hurricanes don’t get your new gardens. Thanks for your comments, and good wishes, Sara, Daniel, and Naomi. It is great to hear from you. Naomi, I think your brussel sprouts may yet make buds. It sounds like you may have cabbage worms since your leaves are getting eaten up. The leaf damage may stimulate the buds to form. Most brussel sprouts take 85 to 90 days, and you are right they do like it cool and will go a ways into some frosty weather. They like a good bit of watering, with well drained soil and hot weather can cause the sprouts to be loosely formed and the flavor to be stronger. My neighbor tried brussel sprouts two winters ago. She never got the sprouts, but ate lots of greens from the plants. 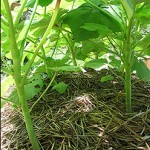 You could try cutting the growing tip off of some of your plants to see if that stimulates the sprouting.